I’ve been struggling with what to post. Do I share another experience? A video? A look into my life? What? OK. I can do a photo. Here you go. This was taken at Robber’s Cave State Park in Wilburton, Oklahoma. It’s the stairs at the dam on Lake Carlton. 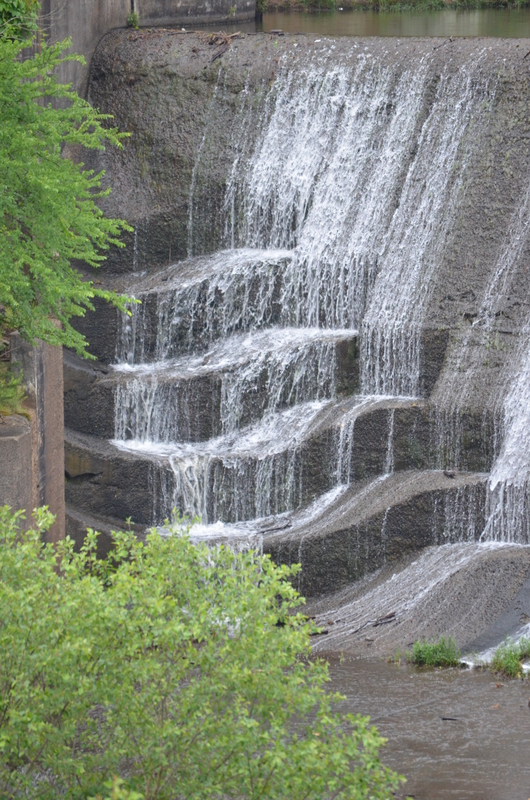 With water rushing over the dam and the stairs,I liked how it looked. You can see how the water landed on the stairs and started cascading down them, too. Video: Why Should You Listen to Me? Yes. Why? Why should you listen to me, or to anyone? Author jencnippsPosted on July 21, 2017 July 20, 2017 Categories planning, workTags 80 Creativity Tips, Create Your Own DIY Planner, creativity, Devoted to Creating, Jen Nipps, planner, planning1 Comment on Video: Why Should You Listen to Me? This is equally important in person and while writing. Actually, it’s probably more important. Last week, I spent some time at Robber’s Cave State Park in Wilburton, Oklahoma. It was my mom, sister-in-law, nephew, one of my nieces, and three cousins. That night at the campfire, my nephew wanted everyone to tell ghost stories. Now, that day also happened to be the anniversary of a very traumatic event for two of the cousins who were with us. I knew that. I forgot that. When my turn came to tell a story, I started telling one I had heard during the ghost tour at the Crescent Hotel in Eureka Springs about a little girl. That had the effect of a bucket of cold water. I could not believe I didn’t think about that. I still can’t. I felt like an inconsiderate dolt. Learn from my mistake. Always, always keep your audience in mind, whether in writing or oral storytelling. To promote my latest book, Create Your Own DIY Planner, I had created an infographic that discusses the five types of DIY planners. I used it as a hook to get people to sign up for my newsletter. Now, I’m giving it to you here. Click through for the full-size version, then save it to your computer. First of all, who writes a reset post and then goes on vacation? Apparently, I do. Oops. Second, here we go. Here’s an introduction to me. Feel free to leave comments either here or on the video over at YouTube. It’s no secret that I’ve had problems with consistency on this blog. Back in May, I attempted to revive it. Then I had to go back to Wound Care and keep my foot up for another month. On Friday, I was discharged from Wound Care (again) and now I’m back to the blog. The difference this time is that I am actually working on a content plan instead of winging it. I discovered a couple years ago that just winging it doesn’t work for me in writing, so why did I continue to expect that it would with blogging? I don’t have an answer for that other than to say I’ve been lazy. I will be posting three times a week minimum. Those are the planned posts. Monday, Wednesday, and Saturday. The Saturday posts will be a week-in-review type, so if there’s anything that happened that you missed because I didn’t blog it, it will be there on Saturday. By the way, I mentioned that I will be talking about books. Just as a quick heads-up, I want to let you know there is a new one available. Create Your Own DIY Planner. It’s available on Smashwords (in your format of choice) and Amazon (because for some reason it didn’t auto-populate to Amazon and I had to do it manually). Check it out and let me know what you think. I am planning on a print version by the end of August. That’s it until Wednesday. I’ll see you then. Author jencnippsPosted on July 3, 2017 Categories planning, workTags Amazon, Create Your Own DIY Planner, Jen Nipps, Kindle, planning, reset button, SmashwordsLeave a comment on Where’s My Reset Button? Create Your Own DIY Planner is now available on Smashwords. It will soon be available on Amazon and other ebook retailers! A print version, with sample layouts you can copy and use in your own planner, will be available by the end of summer. Author jencnippsPosted on May 24, 2017 Categories planningTags Create Your Own DIY Planner, Jen Nipps, SmashwordsLeave a comment on We Are Launched!